What is 33, base four, plus 21, base four? Convert the total to number base 10 (the corresponding decimal system). (B) convert both numbers to base 10, add the base 10 numbers, and then convert the answer back into base 4. 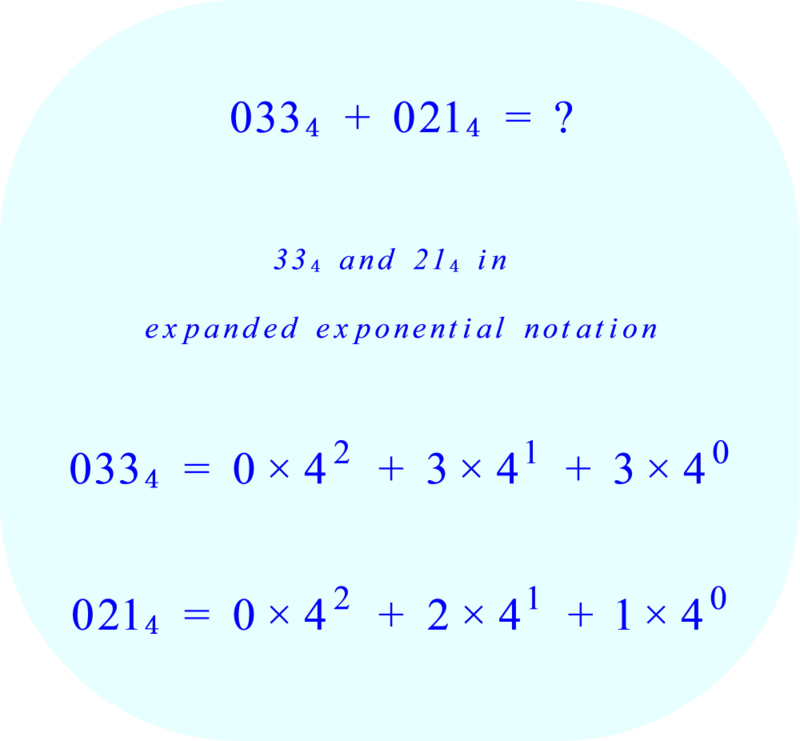 This approach may be easier to understand if you begin by writing the numbers 33₄ and 21₄ in expanded exponential notation. Base 4 numbers use a place-value notation system (also called positional notation), just like numbers written in the Base 10. The place-value notation system allows the same digits to be used over and over again. The ability to use the same digits over and over makes the place-value notation system superior to other numbering systems. Other numbering systems require the user to memorize different symbols for different values (eg: roman numerals, Egyptian Number System , Greek Number System , etc.). Regardless of what number is being written, the base 4 system only uses the four single digits 0, 1, 2, 3 over and over again. Regardless of what number is being written, the base 10 system only uses the ten single digits 0, 1, 2, 3, 4, 5, 6, 7, 8, 9 over and over again. The value of the digit depends on the value of its position within the number. The digit 2 has a different value depending on whether it is written in the 1’s column, the 10’s column, or the 100’s column. 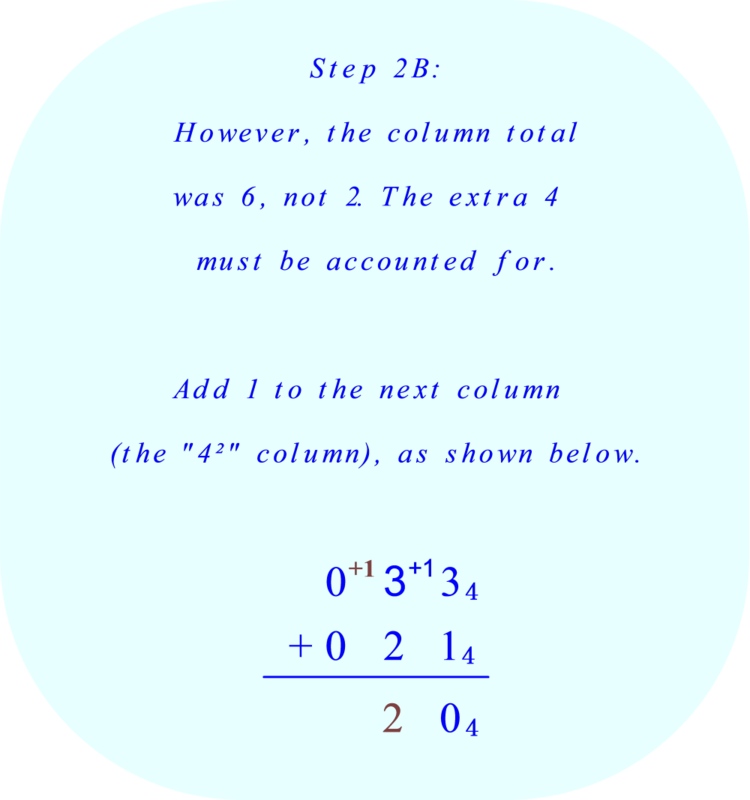 The digit 2 has a different value depending on whether it is written in the 4⁰ column, the 4¹ column, or the 4² column. 4 does not use the digits 0, 1, 2, or 3. Base 4 numbers can only use one of the four digits which are less than 4, either 0, 1, 2, or 3. (In the base four system, the number 4₁₀ is represented as 10₄, as shown below. To proceed with the arithmetic, simply subtract 4 from the column total: 4 – 4 = 0. But the total was 4, not 0. The 4 must be accounted for. 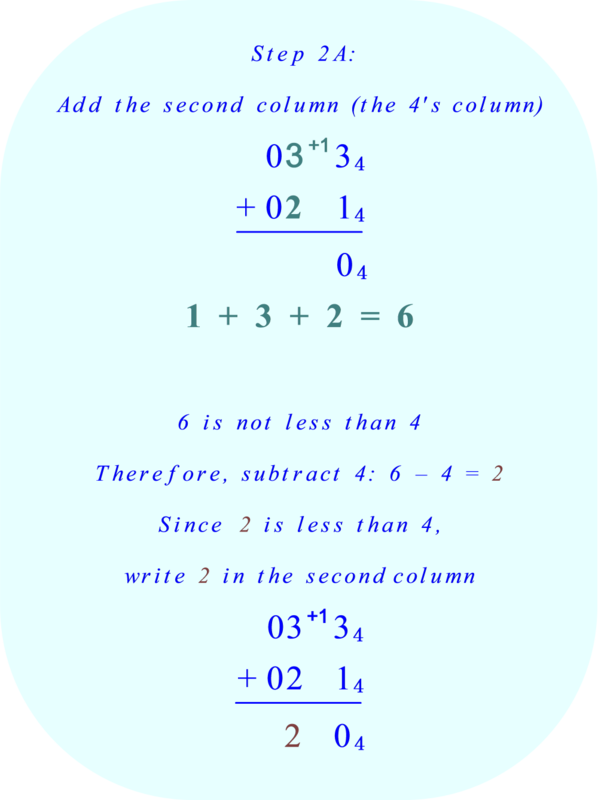 Add 1 to the next column (the "4¹" column, also called the fours’ column since 4¹ = 4), as shown below. 6 does not use the digits 0, 1, 2, or 3. 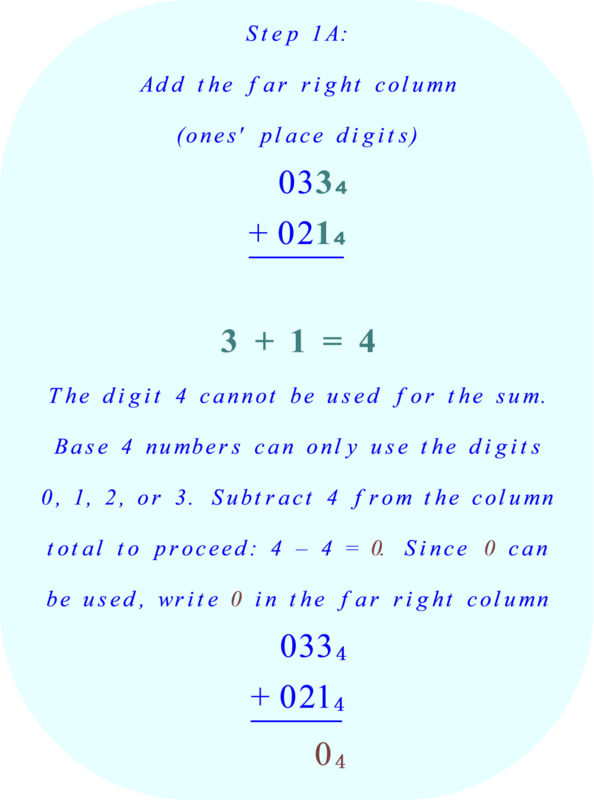 Base 4 numbers can only use one of the four digits which are less than 4, either 0, 1, 2, or 3. (In the base four system, the number 6₁₀ is represented as 12₄, as shown below. Therefore, subtract 4: 6 – 4 = 2. But the total was 6, not 2. The extra 4 must be accounted for. 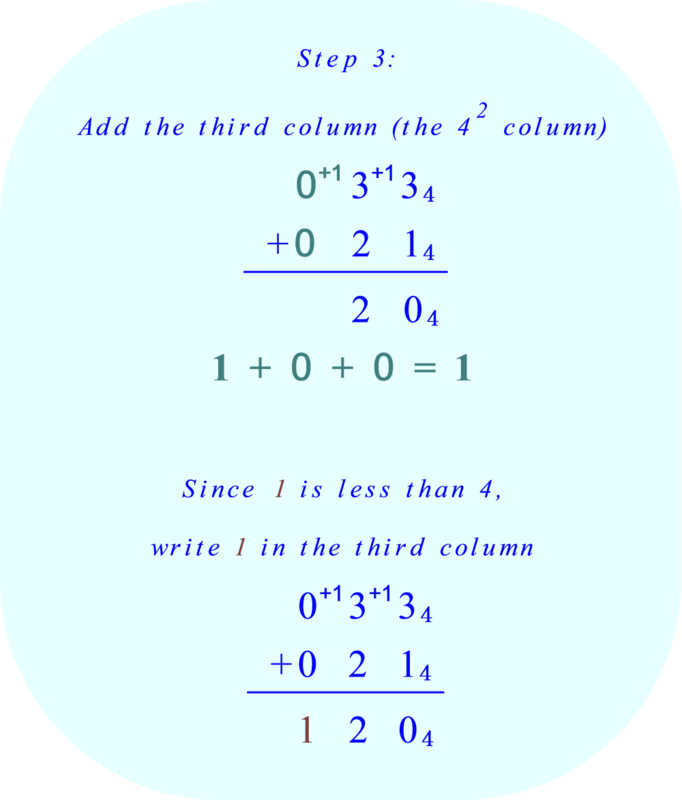 Add 1 to the next column (the "4²" column). Since we are converting to the number base 4, divide by 4.